Perhaps you've noticed sandwich-board signs posted near Burlington's American Red Cross blood donation center announcing that Vermont is in the midst of a critical blood shortage. The signs, which tug at our heartstrings and lure us with free doughnuts and movie tickets, beckon the unsqueamish among us to open a vein and donate a pint of our life-giving fluid. Alas, most of us don't. According to the Red Cross, only 3 percent of Americans give, even though the vast majority of healthy adults qualify to do so. And yet, we all expect blood to be available immediately if we or a loved one requires a transfusion during surgery or after an accident. This situation got one of our readers wondering: Why does Burlington still experience blood shortages at a time when the United States is actually one of the world's largest blood exporters? The reader also asked: To meet its need, why doesn't the Red Cross pay its donors in cash, as for-profit blood banks do, rather than in orange juice and Oreos? WTF? The reason for the shortages is simple, explained Mary Brant, Red Cross communications manager for northern New England. "The need for blood is constant and varies on a day-to-day basis," she wrote via email. Vermont is part of the Red Cross Northern New England Region, which includes Maine and New Hampshire. The region must collect approximately 500 units of blood every day to meet the needs of area hospitals. Nationwide, someone needs a blood transfusion every two seconds. The Red Cross, which manages 40 percent of the U.S. blood supply, must collect 13,000 blood donations as well as 2,500 platelet donations per day to supply patients at about 2,600 hospitals across the country. Platelets, a key clotting component that is extracted from blood during the donation procedure, are often needed for patients with cancer, chronic diseases and traumatic injuries. Because platelets must be transfused within five days of donation, Brant noted, they are always needed. Given such high domestic demand, why does the U.S. ship blood overseas? Short answer: money. There's gold in them there veins, and not everyone taps it for purely altruistic purposes. Blood plasma, a straw-colored liquid that comprises about 55 percent of our blood and is extracted in a method similar to that for platelets, is used for patients with burns, traumas and clotting deficiency disorders. Because plasma is an extremely valuable commodity, donors are often paid for theirs. Growing demand in recent years has led to a sharp uptick in the number of for-profit blood collection centers, which often set up shop in low-income areas. 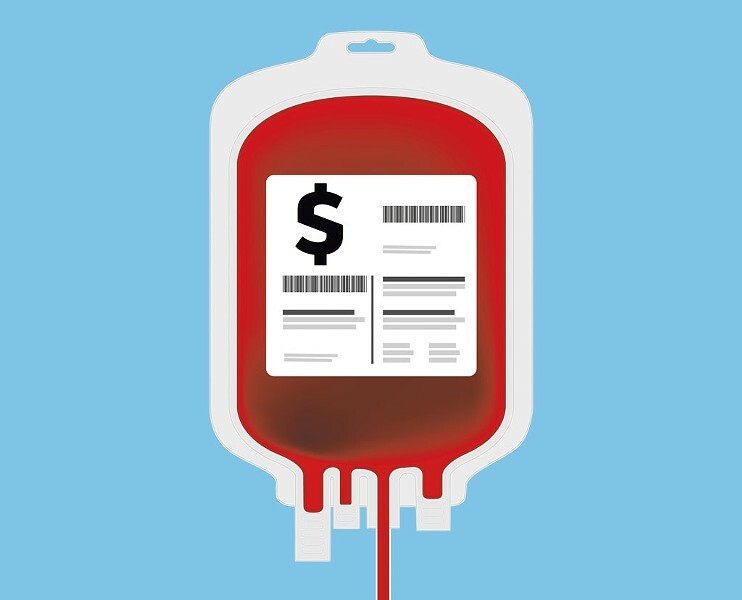 The U.S., unlike many countries, lets people sell their blood as often as twice a week, at a going rate of $30 to $50 per pint. Consequently, the U.S. is now the third largest exporter of human blood. As the Atlantic reported in March 2018, global sales of blood plasma jumped from $5 billion in 2000 to $20 billion in 2015. In 2016, America's for-profit blood plasma industry accounted for an astonishing 1.6 percent of total U.S. exports. What's driving the world's insatiable thirst for blood? The answer, as is often the case with international trade, is demand from China. According to a 338-page report published by WinterGreen Research, titled "Blood Plasma: Market Shares, Strategy, and Forecasts, Worldwide, 2018 to 2024," liver disease is a major cause of illness and death around the globe. The problem is acute in China, where 400 million people have liver diseases, primarily viral hepatitis, and need serum albumin, a blood protein used to treat it. In 2017, the report notes, Chinese patients consumed 400 metric tons of serum albumin, which represented about half the world's consumption that year. China's own population easily could have met that demand, were it not for the fact that many Chinese are now afraid to donate — and with good reason. In the mid-1990s, tens of thousands of poor farmers who were paid to donate blood contracted HIV/AIDS from unsanitary needles, a scandal the Chinese government tried to conceal for years. Thankfully, one reason America's blood is in such high demand is because it's considered among the safest supplies in the world. So why can't people earn literal blood money in Vermont? One reason is that there are no for-profit donation centers here; the Red Cross doesn't pay for blood, arguing that the U.S. blood supply is safer when people give, as Brant put it, "for altruistic motivations." In fact, all blood, donated or sold, must be labeled as to whether it was received from a paid source or volunteer. The World Health Organization urges hospitals to use only volunteered blood, because those donors are less likely to lie about their health and lifestyles. If you're one of the rare red-blooded Americans who donates regularly, how do you know if your hemoglobin is going global? According to Brant, the Red Cross supplies blood products to hospitals in about 45 states, the District of Columbia, and the U.S. territories of Puerto Rico, the U.S. Virgin Islands, Guam and American Samoa. It also supplies hospitals on the Northern Mariana Islands and the Marshall Islands. That said, the Red Cross always prioritizes local need, meaning that if your community needs your red stuff, it stays here. Only after regional demands are met does Vermont blood get pumped out to other locations via a national inventory-management system. "Eligible donors can feel good knowing that, by donating through the Red Cross, they may be helping patients not only in their community but also family and friends across the nation," said Brant. Or, as a hematologist might say when pondering your blood type: Be positive. January is National Blood Donor Month. To donate or organize a blood drive, contact the American Red Cross of Vermont at 660-9130 or visit redcross.org.